I love pretzels. I love them at the airport, in the mall, from a concession stand……basically wherever and whenever. 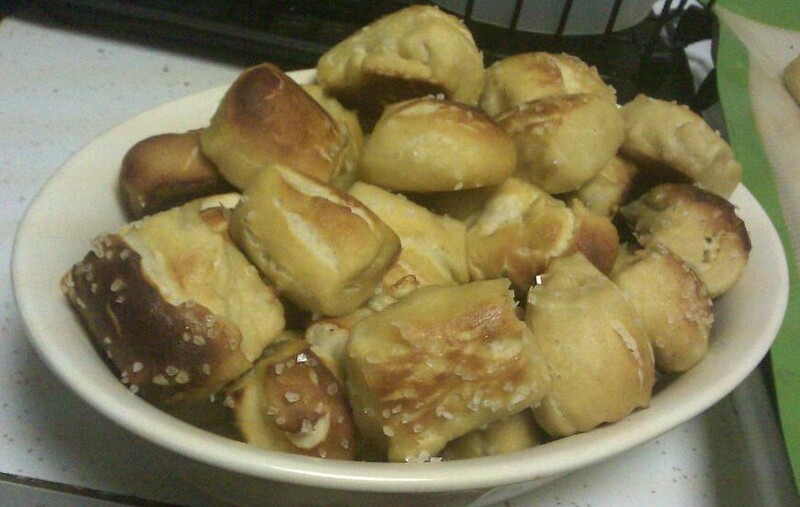 I have seen recipes for pretzels, but just hadn’t gotten up the courage to try them yet. I had a free afternoon before the Superbowl a few weeks ago, and thought that I would finally attempt to make pretzels at home. Success! They were not very difficult to make and I was very happy with their crunchy outside and chewy inside. I bought spiced brown mustard to serve alongside them at the Superbowl party. Enjoy! Whisk one egg with 1 tablespoon of cold water. 1. In the bowl of a stand mixer,stir to combine the warm water, brown sugar, yeast and melted butter. Let sit about 5 minutes, until it has become foamy. 2. In the same bowl, using the dough hook attachment in a stand mixer, slowly add the salt and flour until just combined. 3. Increase the speed of the mixer to about medium-low. Keep mixing/kneading until the dough looks more elastic and starts to pull away from the sides of the mixing bowl. This takes about 3-4 minutes. 4. Using your hands, remove the dough from the bowl and knead slightly to form it into a ball. Place in a lightly greased bowl and cover with a dish cloth. Put in a warm place (I put it in front of my space heater) and let it rise until it doubles, about one hour. 5. When the dough has doubled, remove it from the bowl and place on a generously floured counter. Punch it down and divide into 8 equal pieces. Preheat your oven to 425 degrees. 6. Roll each piece into a long rope, like a snake. The recipe I used said about 18-20 inches, but I couldn’t get mine that long without it breaking. Cut each rope into 1-inch pieces and place them on a baking sheet (I lined mine with parchment paper). I tried to get between 7-8 little pretzel bites from each rope of dough. 7. Boil your water in a large pan. Once the water is bowling, add the baking soda. It splashes up a bit, so be careful. 8. Boil the pretzel bites for a about 30 seconds. I added enough pretzels in each batch so that they still had plenty of room to float around. If you have a slotted spoon, use it to help you remove them from the water and put back on your baking sheet. 9. Once they are boiled, brush the pretzel bites with the egg wash and sprinkle them with salt. 10. Bake for about 15-18 minutes, until they are golden brown. Cool before serving, but they are definitely best while still warm. Source: The Curvy Carrot. Originally from Two Peas and their Pod.